American Express Hawks Island returns October 16 before the Seattle Seahawks NFC showdown with the Atlanta Falcons. AMEX is providing card members with a pregame fan experience for 12s sure to rock the boat for those in attendance on NFL gameday Sunday. The Sports Techie community blog is proud to share another unique AMEX promotional opportunity with fellow 12thMan and also any local Falcons fans that want to take part in this one-of-a-kind sport party. Tickets for Hawks Island are available online today, Thursday, at 12 pm PT via the phone number 800-445-7374 and using an American Express Card. The technology it takes to pull off an event like this has many components from ticketing, to security to concessions making Hawks Island a sports tech showcase. American Express And Seattle Seahawks Present Hawks Island Fan Experience For 12s – Sports Techie blog. In partnership with the Seahawks, AMEX is breaking out a 200 foot barge moored on Pier 66 on the Puget Sound. This vessel is the length of two basketball courts and is equipped with a music stage, seating and a replica football turf similar to the look and feel of the one inside CenturyLink Stadium. 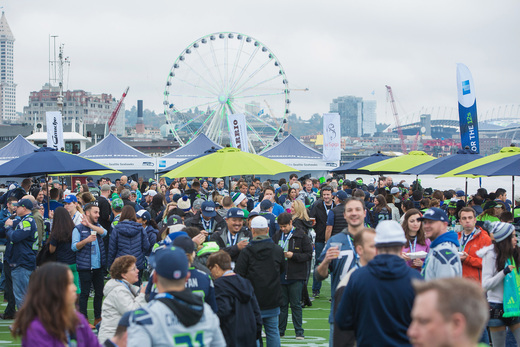 The ship will be loaded with special appearances by team legends, an assortment of pre-game activities and of course, premium food and beverages highlighting select Seattle eateries you definitely want to partake in before the game. During last year’s first ever Hawks Island, Seahawks legend Shaun Alexander, UFC mixed martial arts fighter Miesha Tate and PNW rock band Everclear participated in this lifetime memory. In partnership with the Seahawks, AMEX is breaking out a 200 foot barge moored on Pier 66 on the Puget Sound. American Express Hawks Island returns October 16 before the Seattle Seahawks NFC showdown with the Atlanta Falcons. Reserved your complimentary tickets exclusively for American Express card members today, September 29, 2016, beginning at 12 PM PT on a first-come, first-served basis because availability is limited. You must be over 21-years old to attend. Tickets will be available at 12pm PT today via the phone number 800-445-7374 and using your American Express Card. 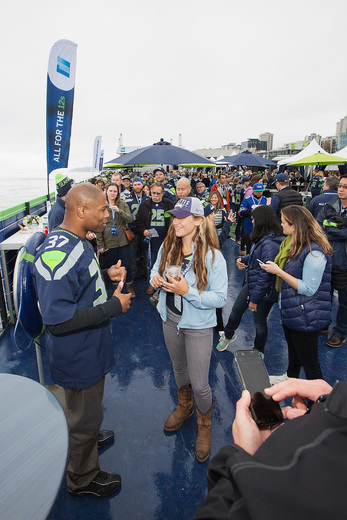 During last year’s first ever Hawks Island, Seattle Seahawks Legend Shaun Alexander, UFC Mixed Martial Arts Fighter Miesha Tate and rock band Everclear made appearances. Hawks Island is part of the All for the 12s marketing initiative designed to work together with Seattle merchants and the organization to create benefits and opportunities exclusively for Card Members and 12s all season long. Other programs include the Section 12 pre-game activation, merchant offers, and gift-with-purchase deals for American Express Card Members. The 2016 partnership kicked off with a special invite only preseason “Dinner on the 50” experience on CenturyLink Field attended by 400 Card Members with surprise appearances from current Seahawks players, Bobby Wagner, Tyler Lockett and Earl Thomas, who held a special Q&A while everyone enjoyed their meal. Attendees began the evening by running through the players’ tunnel to dine on the 50-yard line. How was this event a win-win-win for Amex, the Seahawks and the YMCA? At American Express, it is important to us to go above and beyond for our Card Members by providing unforgettable experiences and exceptional customer service. Dinner on the 50 allowed both American Express and the Seahawks to elevate relationships with the “12s” fan base through a unique and intimate player-fan experience, while also enriching the general Seattle community by donating proceeds from ticket sales to the local YMCA. We believe this was a win-win for everyone involved. Do you measure the social media return of hashtag, #AmexSeahawks, and if so, what were the results? While we do not release this data, we can say that social engagement from those who attended was very strong. What was the Amex card member diversity breakdown in terms of demographics? For example, men versus women, were there youth, were there season ticket holders, and what was the favorite jersey number worn? While we cannot elaborate on specifics, we can say that men, women and children all attended the event—season ticket holders and non-season ticket holders alike. Are Thomas, Wagner and Lockett scheduled to participate in future events and if so, which ones? The players were a tremendous presence during Dinner on the 50 – particularly during the interactive fan panel. While we can’t confirm if they will be a part of future events at this point, we enjoyed working with all three of them. The fan-acclaimed American Express Hawks Island is returning to the Puget Sound for Seattle Seahawks fans – the 12s – on Sunday, October 16, before the Seahawks’ game against the Atlanta Falcons. Sports Techie, the only AMEX NFL sponsor are the Seahawks. By doing so, American Express is fully on board with providing innovative experiences and exclusive services for card members that only the Hawks community and 12s can enjoy. This business sponsorship is morphing the industry forward via premium entertainment, tech and lifestyle. 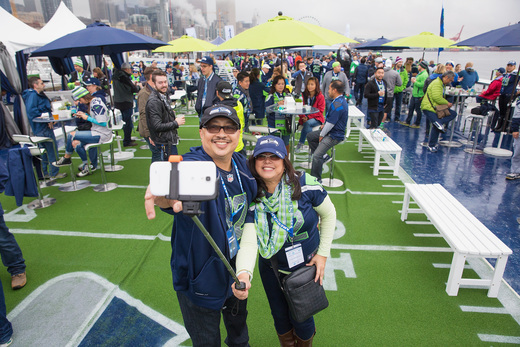 Be sure to add your fan experience photos, videos and conversations across social media using hashtag #AmexSeahawks. I will be there on Hawks Island in spirit.